September 15, 2017 - Lenexa, Kan. - Ceva Animal Health is donating a 30 day supply of Vectra® 3D for Dogs to any dog that has been relocated due to recent natural disasters. 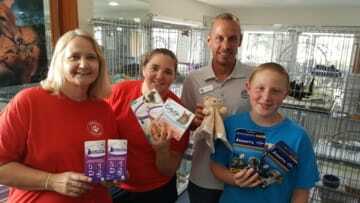 Ceva Territory Manager TJ Fuller dropping off supplies at Suncoast Animal League in Palm Harbour, Fla. The areas of the country being hit hardest by Hurricanes Harvey and Irma have some of the highest incidence rates of heartworm disease in the nation. According to data published by the Companion Animal Parasite Council1, as many as 30% of dogs being relocated may have heartworm disease, one of the most fatal infectious diseases found in dogs. Mosquitoes are the vector of heartworm disease, and relocated dogs can potentially spread the disease to new mosquito populations. But, with proper education and management, the risk can be greatly reduced. In its September Bulletin, the American Heartworm Society released a set of recommendations for the relocation of dogs in shelter and rescue situations. Making sure these pets are safe, free of diseases and parasites is of paramount importance to both the animals being relocated and to the area which will receive and care for these stressed and unfortunate pets. To help shelters mitigate the risk of transmission, Ceva Animal Health is donating a 30 day supply of Vectra® 3D for Dogs to any dog which has been transported from a heartworm endemic area to reduce the possibility of transmission of the disease to other dogs by killing and repelling mosquitoes. The product also provides protection from other external parasites commonly found on dogs coming out of hurricane zones such as fleas, ticks, biting flies, lice and mites. Territory Manager Chad Humphrey dropping off supplies at the Orangeburg, S.C. SPCA. Prior to Hurricane Katrina, heartworm disease was largely unseen outside of the Gulf region and Mississippi Delta. But as dogs were moved outside of Louisiana to shelters across the United States, heartworm began to be found in many of those cities which received those displaced dogs. “We are also concerned for the safety of all the displaced pets. We learned some hard lessons from Katrina. My personal experience with taking in these displaced and unknown pets was eye-opening,” said Christopher J. Rehm, DVM, President of the American Heartworm Society. ”From a heartworm disease and transmission perspective, I feel it is important to know the heartworm status of all pets prior to transport if at all possible. All dogs should be protected with an FDA approved preventive and treated with an EPA approved product kills and repels mosquitoes and kills fleas, ticks, and other disease-carrying pests. If known to be heartworm positive then Doxycycline antibiotic therapy is added to further decrease the chance of heartworm transmission in the dog's new home environment and help prepare the dog for treatment,” said Dr. Rehm. If left untreated heartworm disease can cause a dog to become very sick as heart and lung capacity is diminished. The effects are very much like heart disease in humans and can ultimately lead to death. Shelters who would like to take advantage of Ceva’s offer of Vectra 3D or other pet supplies to help care for displaced animals should email: usa.communications@ceva.com or call 1.800.999.0297. This program is in addition to Ceva's previously announced hurricane relief program which has already resulted in over $150,000 in donations to Texas, Florida, Georgia and South Carolina.